I have a small sailing gunkholer in the San Juans that is kept on a buoy. 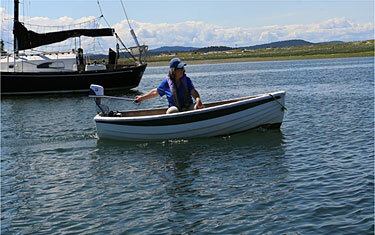 We take a ferry to visit it and use the dinghy like a commuter car with a portable motor. We use a Minto dinghy kept in the water at a local restaurant dock. Had to bottom paint it. Not as stable as an inflatable but- any inflatable owners have a similar use case? I like the stability but am concerned about beaching on rocks, swings in temp causing it to feel too tight in the day and then soft in the evenings, punctures, fowling over extended periods in the water etc. Looking for opinions and suggestions. Ummm, this is not that kind of dinghy anarchy, you might be better served over on cruising anarchy.